Discover why the Mogollon Rim’s views are considered to be some of the most stunning areas in Arizona. During our Scenic Rim Three-Hour Tour, you’ll travel over 1,500 feet in elevation and experience panoramic vistas that stretch for miles. This is a truly unforgettable adventure with Pink® Jeep® Tours. Your custom-built, open-air Pink® Jeep® Wrangler and Certified Interpretive Guide will be waiting for you at The Pink® Jeep® Tour Plaza. Your adventure starts on Schnebly Hill Road and historic Munds Wagon Trail, heading through canyons and over rocky trails. You’ll travel up to iconic Merry-Go-Round Rock and past the Cow Pies rock formations. The Mogollon Rim is your ultimate destination. This enormous wall of rock extends across most of the state. Thousands of feet tall and hundreds of miles long, it is known as the “backbone of Arizona.” Your Pink® Jeep® will climb through rugged trails surrounded by the world’s largest stand of Ponderosa pine trees. Once you reach the Mogollon Rim, you’re in for edge-of-the-world views that are nearly indescribable in beauty. Bring your camera and wear comfortable shoes—you’ll want to commemorate this trip with photos from remote areas. 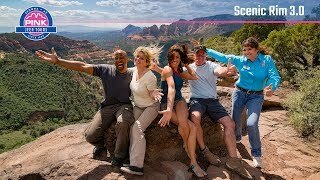 The Scenic Rim Tour captures the essence of Arizona’s unique high country with sweeping scenery, tall pine trees, desert washes, rocky red terrain and enchanting history. After your Pink® Jeep® Tours adventure, you’ll have seen the absolute best the Mogollon Rim has to offer. This was our second Pink Jeep tour and we loved it! Lots of fun, very informative, and of course the views are absolutely unbeatable! My family and i had a great time! Great time. We enjoyed it! It was fun, interesting and amazing. It was so beautiful to see Sedona from that high point. Our guide Cody was great. He was a wealth of information. Great personality too (even if he was a little sarcastic :)!! Fun and educational. Good for family. My family had a great time. The views were spectacular, and we had humorous and informative conversation along the way. Our children (11, 13, 17) had nothing but smiles the whole tour. Also, Mike was conscientious about keeping the environment clean, which we liked.